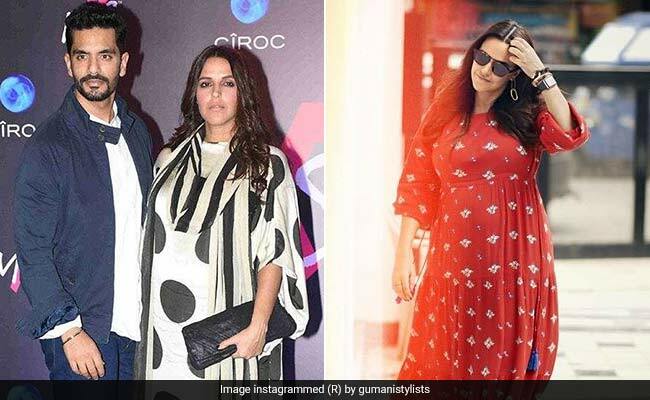 Neha Dhupia may be in the family way but that hasn’t stopped her from being her chic and stylish self. Not only has Neha decided to continue working till the eighth month of her pregnancy, but she leaves no chance whatsoever to rock some seriously modish outfits – all of which are a stylish twist to maternity clothes. From wearing bold colours to chic dresses and even walking the ramp, Neha has done it all with that baby bump. And recently she has been rocking some bold prints. Yesterday, for the making of the first episode for No Filter Neha Season III, Neha wore a bold red Anita Dongre tie-up maxi dress. The dress had floral prints all over and looked quite simple but pretty. Pairing the outfit with brown boots, Neha looked as rad and cool as ever. Last weekend, for the launch of MXS – Designer Monisha Jaising’s fashion collection with Shweta Bachchan Nanda – Neha was seen in a Naushad Ali dress with massive polka dots all over. Now that could have been a risky move for many but, of course, Neha carried off the bold print like a boss lady that she consistently is. Another dress that had us gawking at Neha’s style was this solid yellow maxi dress by Chandni Sahi paired with a long sleeveless beige jacket on top. That pregnancy glow is surely hard to miss. While we can’t wait for the happy news, we also can’t wait for more beautiful additions to Neha’s tryst with maternity fashion. Here’s to revamping style statements, Neha!